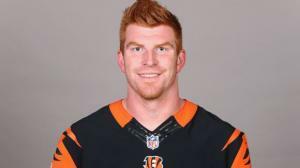 Andrew Gregory Dalton was born on the 29th October 1987, in Katy, Texas USA, and is an American Football player, who currently plays for the Cincinnati Bengals as a quarterback. His career has been active since 2011. Have you ever wondered how rich Andy Dalton is, as of mid-2016? According to authoritative sources, it has been estimated that Andy Dalton`s net worth is as high as $15 million, an amount earned through his successful career as a football player; his salary is $12 million, which will certainly increase further his net worth in the coming years. Andy took a football in his hands in high school, and immediately created an unbreakable bond. He attended Katy High School, and became one of the best players in his class; in 2005 he was the best player on the high school team, and helped them reached the finals, however, they lost to Southlake Carroll. After high school, Andy enrolled at Texas Christian University where he continued playing football, and won several prestigious awards as an individual, and set several records. He set records for passing yards with 10,314), pass attempts at 1,317 and also has 812 completed passes, which only helped him acquire a higher draft position. He won the Rose Bowl Offensive MVP award in 2011, and was in the First-team All-MWC twice, in 2009 and 2010. Furthermore, he was named as Texas Bowl MVP in 2007. After he graduated, he entered the 2011 NFL Draft, and was selected as the 35th overall pick by the Cincinnati Bengals, and ever since has been playing for the club. Upon arrival he signed a contract worth $5.2 million over three years, which certainly increased his net worth, however, in 2014, he received a new contract offer, worth $115 million over six years, which he accepted, increasing further his net worth. In his first season, Andy played in all 16 games, had 20 touchdown passes and completed 300 of 500 attempts, becoming one of the five quarterbacks that in their rookie season threw over 3000 yards, and had at least 20 touchdown passes, joining such legends as Peyton Manning, Cam Newton, Charlie Conerly, and Dan Marino. His second season was also successful, having 328 completed passes and had 3,669 passing yards which led to 27 touchdowns. 2013 season was his best so far, as he had 363 completed passes for 4,293 yards, leading to 33 touchdowns. In 2015 season, Andy played in 13 games, as he broke his thumb, and missed the last weeks of the season, but still recorded 3,250 yards from 255 successful passes. Although his career has just began, he has already build a name for himself, and has won several awards, including the NFLPA Emerging Player Award, and was the AFC passer rating leader in 2015. Furthermore, Andy has recorded two Pro-Bowl appearances, in 2011 and 2014. When it comes to speak about his personal life, Andy has been married to Jordan Jones since July 2014; the couple has one son. Andy is also recognized as a philanthropist, starting a foundation which helps children and families in need. He regards himself as a Christian and is very devoted to faith, stating that he owes all his success to God. 1 Quarterback for the Texas Christian University Horned Frogs, 2007-2010. 2 Selected by the Cincinnati Bengals in the 2nd round (35th overall) of the 2011 NFL draft. 3 Quarterback with the Cincinnati Bengals, 2011-present).